A group of Lockhart River roadworkers have formed their own business and tendered for work that would otherwise go to a fly-in fly-out workforce. Councillor Paul Piva, responsible for economic development in the community, said some 70 kilometres of roadworks around the community provided council with a chance to build local capacity. “It’s given us the opportunity to get 100 per cent Indigenous boys to go out there and work on the roads,” Cr Piva said. The $2 million worth of contracts have employed eight young men including 35-year-old Kanthanumpu man Wilfred Accoom who commutes two hours between site and home each day. “We’ve just been working on the formation of the road, putting re-sheet on the road,” Mr Accoom said. Mr Accoom said the long days and hard work would pay off, for both him and his people. “The money stays in the community amongst all the locals and more employment for the young people,” he said. Darren Macumboy, aged 38, is a new trainee. He worked as a groundsman at the local school for about six years but saw the roadworks as a chance to learn new skills and earn more money for his family. “It’s time for me to seek different jobs. I’m doing my training on a roller and it’s definitely been a different experience from other jobs that I do,” Mr Macumboy said. The Wuthathi man said he was proud to be building roads on his country and wanted to set a path for his people. “When I’m working in community it feels good, you know you’re not away from your family and you’re right here working, you’re surrounded by families too,” he said. 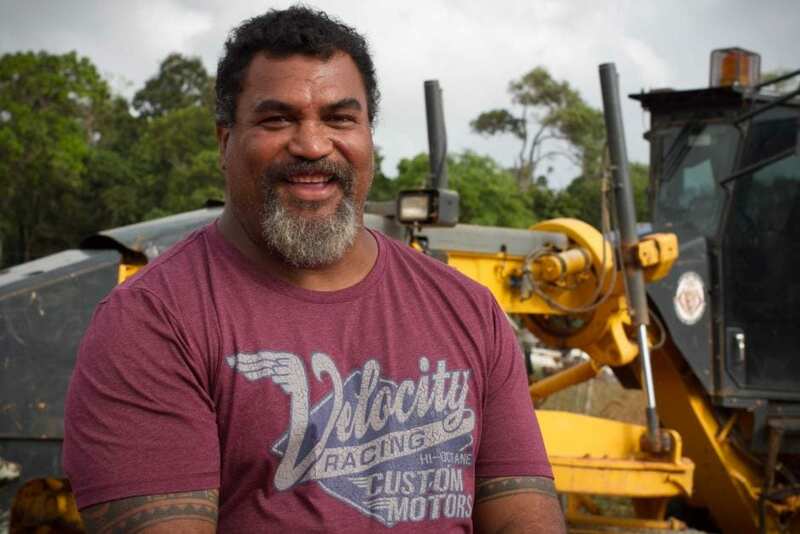 Lockhart River’s goal is to build local entrepreneurs and Cr Piva said he hoped his shire’s early success could pave the way for other Indigenous business opportunities. “I hope that there are companies out there willing to give us a go like Tutt Bryant’s done, giving us the faith to lease their machines,” Cr Piva said. “There are opportunities out there, just get out there and give it a go. The Pascoe Farm roadworks will be completed by the end of August.